Built in 1870 and one of the oldest buildings in the Park, our historic stables received grand renovations due to an anonymous donation of $485,000 earlier in the year. The preservation project included rebuilding portions of the deteriorated walls, adding a modern electrical system, and salvaging the original wood paver flooring. The Victorian structure houses the Park’s Clydesdale horse, Moonshine, and Shetland pony, Sheffield. Constructed before widespread use of mechanized equipment, the Tower Grove Park stable originally housed working mules. The building is located in the northwest quadrant of the Park, just east of the intersection of Magnolia and Alfred avenues. The structure features rustic Missouri limestone walls, a bell tower reminiscent of the Alamo, and an unusual end-grain woodblock floor. While the stable was operational before the restoration, the walls displayed decades of patchwork repairs, portions of the floor had sunken, and the roof suffered from deferred maintenance. Thanks to the generosity of the anonymous donor and hard work from Trivers Associates, this historic structure has been fully and painstakingly restored to its historic glory. The entire exterior was tuck-pointed with appropriate materials and stone replacement, including the rebuilding of the bell gable. New roof, windows, and doors were installed; and architectural lighting added. The interior floor blocks were removed and re-set with new subflooring. The building now has all-new electric, plumbing, ventilation, and heat. A horse washing station was added, and the employee restroom attached to the residence was renovated. The site was graded to improve drainage for both the stable yard and paddock. Finally, great care was taken to salvage and re-install the original wood paver flooring. The end result is a magnificent renewal of this rare Victorian structure, as well as a more comfortable and accommodating space for both horses and humans. 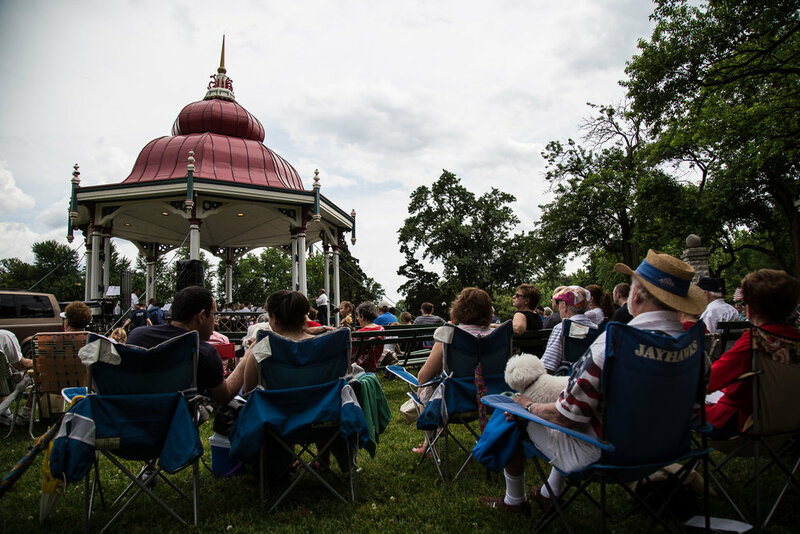 Tower Grove Park dates to the Victorian era and was designed for both pedestrian and horse-carriage traffic. With the dawn of the automobile age, however, horses became an uncommon sight in the Park. In 1998, with the help of generous donor Tim Hays, Tower Grove Park purchased a horse and two Victorian-style carriages. Today, a full-time stable master cares for the Park’s horses: Moonshine, a Clydesdale gelding, and his companion animal Sheffield, a Shetland pony. Visitors can reserve a horse-drawn carriage ride to see the Park as a Victorian visitor might have. Click on towergrovepark.org/carriage-rides to learn more.